Heat is oppressive. It wasn't until this summer that I fully began to understand the effects of a never-ending swelter. With a heatwave lasting the length of the sunny season bearing down on me, cool air has seemingly become a luxury of the past. I now realize just how often I took air conditioning (and a hundred other little things) for granted since I moved into a new apartment in a new city. I used to think heat was glamorous. After reading books set in the deep south such as The Secret Life of Bees and watching movies like Gone With the Wind, my perspective has become skewed. I imagine pretty girls in patterned dresses drinking lemonade on the back porch and fanning themselves with a good book to stave off the sultriness of summer. My apartment is on the top floor of a building; when temperatures rise, the heat in the building rises, and I'm left with a kitchen that could pass for a sauna. The blazing sun has become an unwelcome sight in my windows. Keeping the blinds closed has become something of a survival tactic, as my apartment converts into a stifled cave when I struggle to keep out the heat. I have a small wall air conditioner, but it is useless against the rising heat of the building, scarcely lowering the temperature after running for most of the day. The heat rarely registers below ninety degrees in my living room and I am starting to understand how food roasting in the oven must feel. At night the temperature impossibly rises as I strip the bed of sheets and fall into a fitful sleep in the path of an industrial fan. I've suffered bouts of heat exhaustion simply from lying on the couch in a heat induced stupor for too long, exhausted and dehydrated from doing absolutely nothing. There is nothing glamorous about heat. I couldn't have been more wrong in my fantasies of the women of the south and their glasses of lemonade and magazine fans. Now, after living in my own little "deep south," I can appreciate how much people do suffer in the heat, with humidity so high that it suffocates and air so still it feels like a boa constrictor slowing wrapping itself around your body. Heat is really just sweat, frizzy hair, and dreams of crawling into the freezer next to the frozen vegetables. Last weekend, my parents held a small summer party and I offered to make a couple desserts. 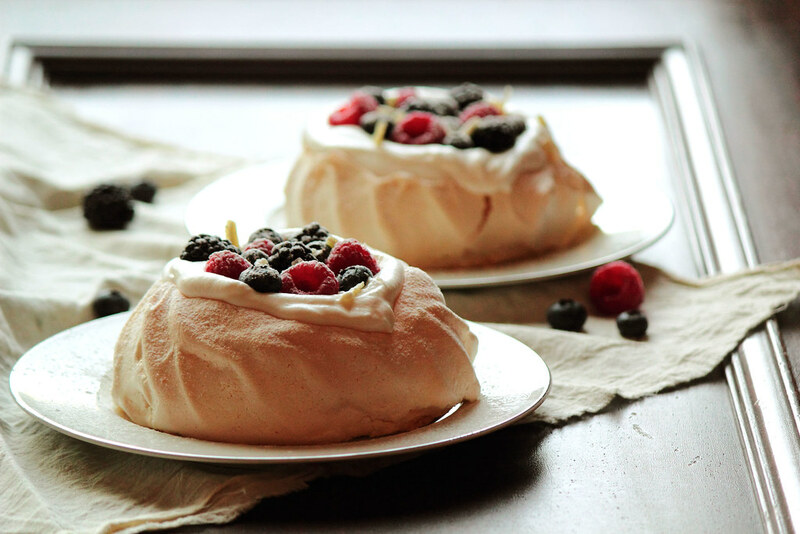 Outside in the hot summer air, these Summer Berry Pavlovas were a cool treat to serve and impress. They are light and delicate, which is a lovely quality during the dog days of summer when a bowl of cold cereal is good enough to call dinner. 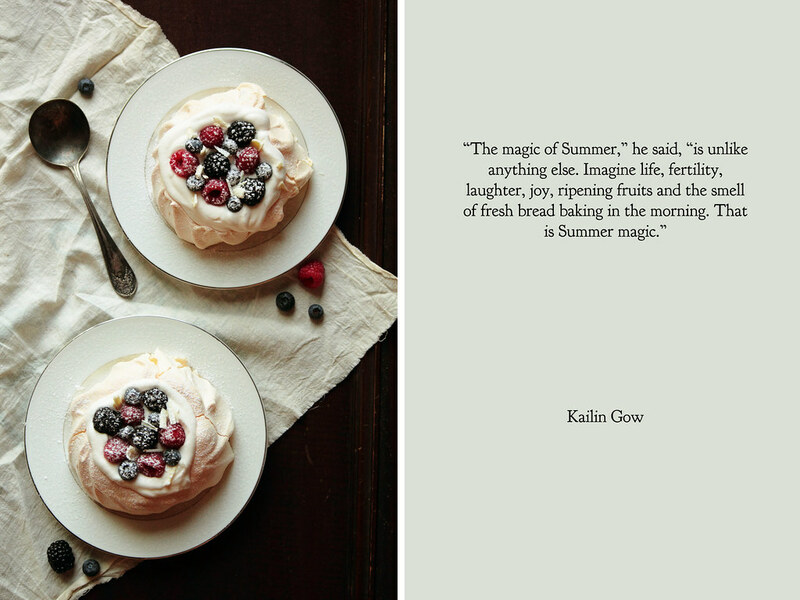 This Summer Berry Pavlova is sweet, light, and fresh. 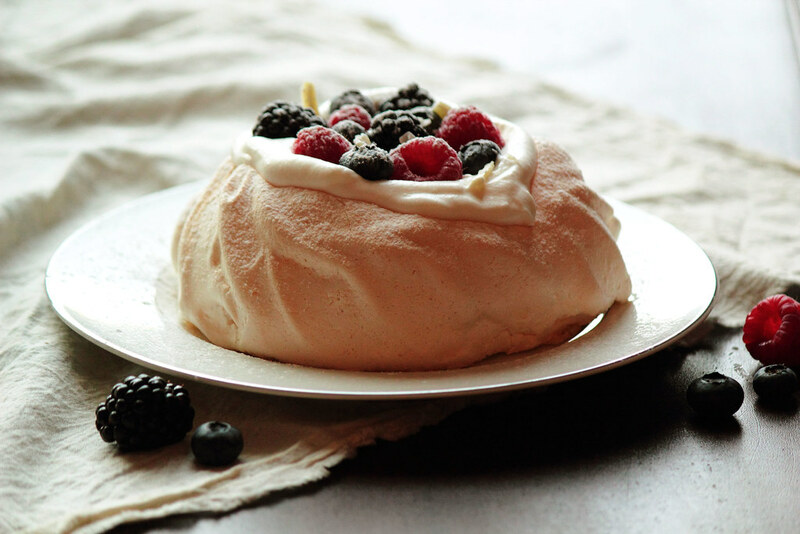 The pavlova is a large meringue with a crisp exterior and a soft, marshmallow-like interior. When the pavolva cools, the center collapses, revealing a cavity that is filled with a white chocolate whipped cream. 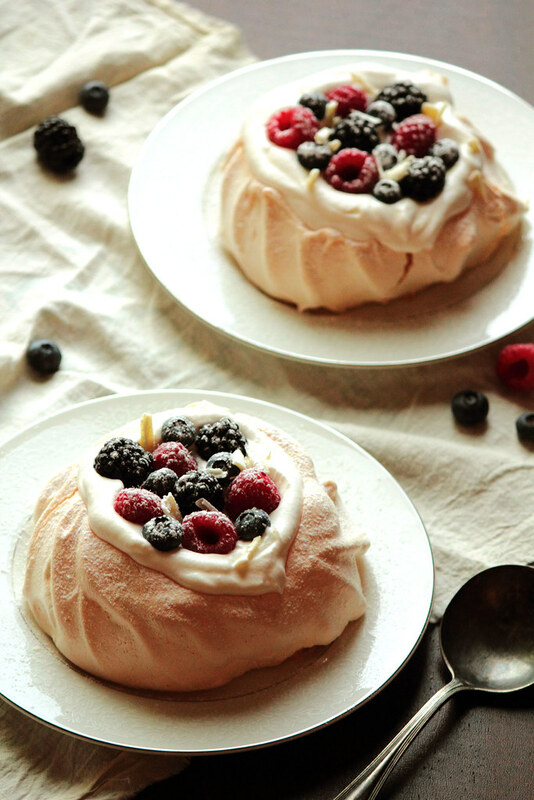 The pavlova is topped with fresh raspberries, blueberries, and blackberries, with white chocolate shavings and a dusting of powdered sugar. These are a cool delight when the heat is high and friends are near.